Sometimes, the best of intentions go awry. Fortunately, there’s always frozen puff pastry. Emergency desserts during the summer are easy — who needs to gild perfect berries? — but as autumn settles in, it’s more of a challenge to impress VIP guests, say, eight culinary experts called for a special meeting. And you’re supposed to make dessert. No pressure. When your beautiful pears are still hard and you don’t have a single hour more to ripen them in that handy paper bag, it’s time for poaching. Make a simple syrup by mixing together in a saucepan 1 part water, 1 part sugar, ribbons of lemon peel, and a few knobs of ginger. Crush the ginger to relieve stress and release flavor. 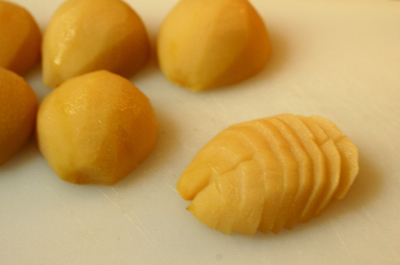 Peel your pears and cut them in half. Use a small spoon or melon baller to scoop out the core, and then plop the fruit into the poaching liquid. 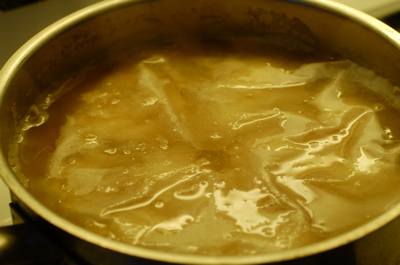 Bring to a simmer over medium-high, and then lower the heat to maintain a gentle simmer. 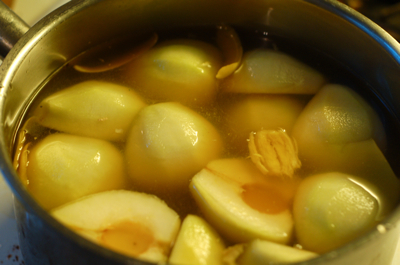 Press a round of parchment up against the pears to keep them moist all around and to help cook them evenly. (Remember this tip for matzo balls and red-cooked pork, too.) Make the round just a tad bit smaller than the diameter of the pan, and cut a venting hole at the center. If you don’t have parchment paper, use a smaller pot lid or a flat saucer to keep the pears immersed, but be careful not to press dents into the softening fruit. 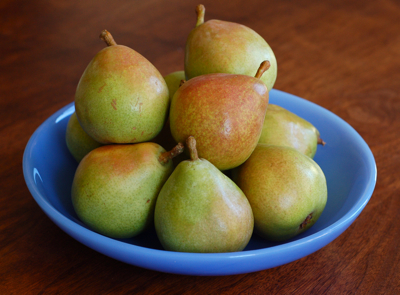 They’re ready when the tip of a paring knife cuts easily to the center, 20 minutes for some pears, 40 for others. 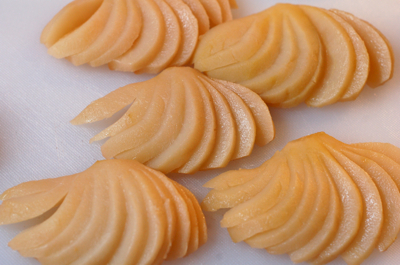 For tiny tartlets that will be served on a buffet, cut the pears in quarters and then slice thinly. If you’re making one big tart for friends or family, just make parallel slices almost to the stem ends and then fan open each pear half. Make a frangipane filling by throwing a cup of blanched or slivered almonds into your food processor. (If you don’t have a food processor, buy almond meal from the nut vendors at the farmers market or visit the baking aisle at your local Trader Joe’s.) Follow with a couple of eggs, 3/4 stick of soft butter (though I’ve been known to use the cold, hard stuff) and 1/4 to 1/2 cup sugar. Flavor with a pinch of salt and a good dash of vanilla. Buzz until a smooth, thick but spreadable mixture forms. Set this aside. Dufour is my favorite, but Trader Joe’s also sells a good all-butter puff pastry that’s worth keeping in your freezer. Thaw the pastry as directed on the package label. Most call for a few hours in the refrigerator, followed by a few minutes at room temperature. You’ll need to work quickly to prevent the butter layers from melting into each other, so gather all your cutters, pans, fillings and glazes before you take the pastry out of the refrigerator. Make an egg wash by mixing together 1 egg and 1 tablespoon water just until foam begins to form. 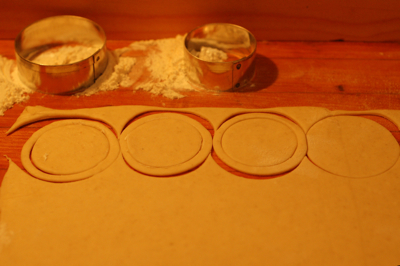 For small tartlets, you’ll need to roll the pastry pretty thin, say 1/8 inch. If you’re making one large tart, you can stop at 1/4 inch, but don’t leave it too thick, or your layers will rise so high they’ll deform and spill your filling. Those who were good at Tetris should be able to squeeze 18 to 24 tartlets, each 1-1/2 inch across, out of one sheet of puff pastry. Be sure to use a sharp knife or pastry round to cut cleanly through the dough. Pressing the rim of a glass or a dull, plastic cutter into your pastry will simply seal together all those lovely layers. Use a small amount of flour as need to prevent sticking, but don’t overdo it. Fastidious bakers will keep a soft brush handy to flick away excess flour. Cut twice as many rounds as you’ll need. Switch to a smaller cutter to punch out the centers of half of the rounds to form rings. Brush the bases lightly but evenly with egg wash, then press the ring onto each large round to make a lip for the filling. 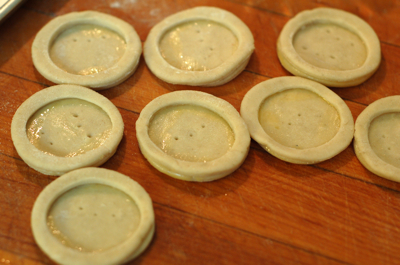 If you don’t have pastry rounds, cut small squares with a sharp knife, then cut thin strips to press around the edges. 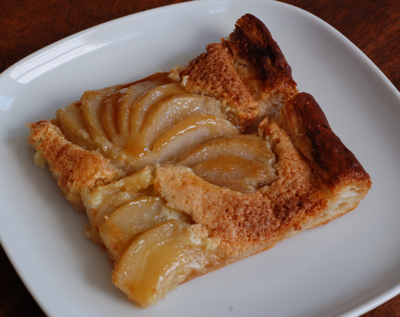 Square tarts are easy, yet look trÃ¨s elegant. Prick the bottom crust once or twice with a fork. If you have time, freeze the crusts for 15 to 30 minutes before baking. Preheat the oven to 425 F (or whatever the package says) and bake the crusts for 10 to 15 minutes, depending on their size. Remove them when they are puffed but do not let them take on color. Reduce the oven to 375 F.
Spread a thin layer of the nut filling into the center of the crusts. Top with the sliced fruit. I like to arrange the fruit with a bit of height for some drama on the buffet. Bake the tartlet’s again for about 20 minutes, or until the filling is golden brown. For a more casual affair, one big tart is fine. It’ll need to be baked for a longer amount of time, say 30 to 40 minutes, but it’s a lot less fuss upfront. Let the tarts cool on a rack for maximum crispness. 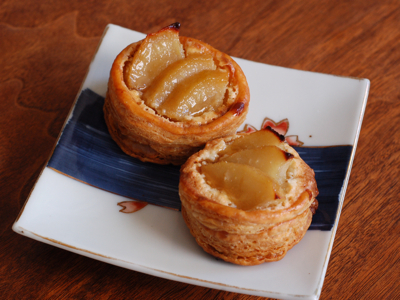 For this batch of tartlets, I reduced the poaching liquid to a thick syrup, and then brushed the pear slices with it for a nice, finishing sheen. You can melt a clear, pale jelly such as apple or white wine-thyme. Or you can just use honey. 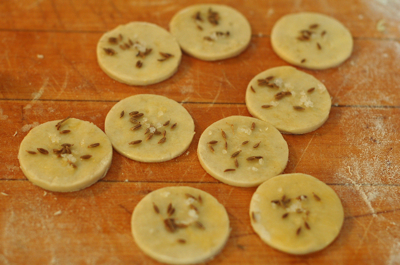 The tarts can be frozen at several points: after rolling and cutting, after the first baking and before filling, or after baking completely. Like with roasting chickens, it doesn’t that much more time to make two rather than one, so go ahead and make extra. Frozen tartlets take only 15 minutes at 275° F to warm up. Extra poached pears make an excellent topping for pancakes, waffles or French toast. Slice and rewarm in butter and brown sugar. Finally, just as doughnut holes are among my favorite treats, the centers of the tartlet rounds end up becoming even more fun to eat then the tarts themselves. Brush with egg wash, sprinkle with fleur de sel and cumin seeds, bake for 10 minutes, and enjoy while still warm with a slice of cheese, a glass of wine and a huge sigh of relief.